It’s the birthday gift every thirteen-year-old wants: The discovery that your parents aren’t your real parents. For Ruby, the discovery that she’s adopted, and that her abusive parents aren’t her actual parents, is galvanizing. Determined to find her real mother and father, she runs away into the woods with nothing but a suitcase and the company of her only true friend—the imaginary Shadow Boy. There, she discovers a group of siblings living by their wits. They take her in, but while they offer the closest Ruby’s ever had to a family, it’s not always clear what’s real and what’s not—or who’s trying to help her and who might be a threat. 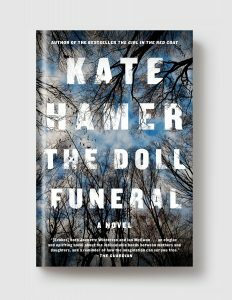 Told from shifting timelines, and the alternating perspectives of Ruby; her mother, Anna; and even the Shadow Boy, The Doll Funeral is a dazzling follow-up to Kate Hamer’s breakout debut, The Girl in the Red Coat, and a gripping, exquisitely mysterious novel about the connections that remain after a family has been broken apart.